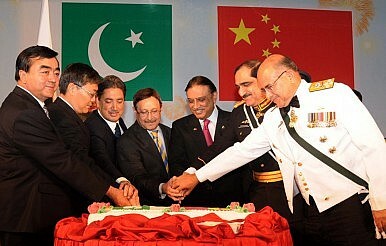 China and Pakistan celebrate 60 years of diplomatic relations in 2011. The China-Pakistan Alliance: The Key to Afghan Stability? Can China promote peace in Afghanistan by nudging Kabul and Islamabad closer together? China's role in Afghanistan is constructive, but not decisive. China Pushes Afghanistan, Pakistan Back Toward Peace ProcessIs China Moving to Control the Indian Ocean? Could China Broker Talks Between the Afghan Government and the Taliban?CPEC Emboldens China and Pakistan’s Joint Effort to Manage MilitancyIs the Crown Jewel of the Belt and Road Losing Its Shine?